Planum Australe (Latin: "the southern plain") is the southern polar plain on Mars. It extends southward of roughly 75°S and is centered at . 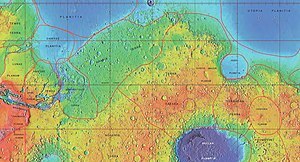 The geology of this region was to be explored by the failed NASA mission Mars Polar Lander, which lost contact on entry into the Martian atmosphere. MOLA colorized relief map of Hesperia Planum, the type area for the Hesperian System. Note that Hesperia Planum has fewer large impact craters than the surrounding Noachian terrain, indicating a younger age. Colors indicate elevation, with red highest, yellow intermediate, and green/blue lowest. The Hesperian is a geologic system and time period on the planet Mars characterized by widespread volcanic activity and catastrophic flooding that carved immense outflow channels across the surface. The Hesperian is an intermediate and transitional period of Martian history. During the Hesperian, Mars changed from the wetter and perhaps warmer world of the Noachian to the dry, cold, and dusty planet seen today. The absolute age of the Hesperian Period is uncertain. The beginning of the period followed the end of the late heavy bombardment and probably corresponds to the start of the lunar Late Imbrian period, around 3700 million years ago (Mya). The end of the Hesperian Period is much more uncertain and could range anywhere from 3200 to 2000 Mya, with 3000 Mya being frequently cited. The Hesperian Period is roughly coincident with the Earth's early Archean Eon. With the decline of heavy impacts at the end of the Noachian, volcanism became the primary geologic process on Mars, producing vast plains of flood basalts and broad volcanic constructs (highland paterae). By Hesperian times, all of the large shield volcanoes on Mars, including Olympus Mons, had begun to form. Volcanic outgassing released large amounts of sulfur dioxide (SO2) and hydrogen sulfide (H2S) into the atmosphere, causing a transition in the style of weathering from dominantly phyllosilicate (clay) to sulfate mineralogy. Liquid water became more localized in extent and turned more acidic as it interacted with SO2 and H2S to form sulfuric acid. Mariner 9 image of Ascraeus Mons. This is one of the first images to show that Mars has large volcanoes. Volcanic activity, or volcanism, has played a significant role in the geologic evolution of Mars. Scientists have known since the Mariner 9 mission in 1972 that volcanic features cover large portions of the Martian surface. These features include extensive lava flows, vast lava plains, and the largest known volcanoes in the Solar System. Martian volcanic features range in age from Noachian (>3.7 billion years) to late Amazonian (< 500 million years), indicating that the planet has been volcanically active throughout its history, and some speculate it probably still is so today. Both Earth and Mars are large, differentiated planets built from similar chondritic materials. 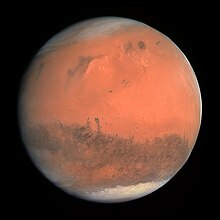 Many of the same magmatic processes that occur on Earth also occurred on Mars, and both planets are similar enough compositionally that the same names can be applied to their igneous rocks and minerals. Volcanism is a process in which magma from a planet’s interior rises through the crust and erupts on the surface. The erupted materials consist of molten rock (lava), hot fragmental debris (tephra or ash), and gases. Volcanism is a principal way that planets release their internal heat. Volcanic eruptions produce distinctive landforms, rock types, and terrains that provide a window on the chemical composition, thermal state, and history of a planet's interior. 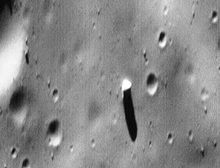 The Phobos monolith (right of center, casting long shadow) as taken by the Mars Global Surveyor (MOC Image 55103, 1998). The Phobos monolith is a large rock on the surface of Mars's moon Phobos. It is a boulder about 85 m (279 ft) across and 90 m (300 ft) tall. A monolith is a geological feature consisting of a single massive piece of rock. Monoliths also occur naturally on Earth, but it has been suggested that the Phobos monolith may be a piece of impact ejecta. The monolith is a bright object near Stickney crater, described as a "building sized" boulder, which casts a prominent shadow. It was discovered by Efrain Palermo, who did extensive surveys of Martian probe imagery, and later confirmed by Lan Fleming, an imaging sub-contractor at NASA Johnson Space Center. Lan Fleming considered the possibility that the Phobos monolith may be artificial and not a geological feature or rock. The general vicinity of the monolith is a proposed landing site by Optech and the Mars Institute, for an unmanned mission to Phobos known as PRIME (Phobos Reconnaissance and International Mars Exploration). The PRIME mission would be composed of an orbiter and lander, and each would carry four instruments designed to study various aspects of Phobos' geology. At present, PRIME has not been funded and does not have a projected launch date. Former astronaut Buzz Aldrin has spoken about the Phobos monolith and his support for a mission to Phobos. Cerberus is a large "dark spot" (an albedo feature) located on Mars and named after the mythical dog Cerberus. The arcuate markings in the upper right are in the Amazonis plains and may be sand drifts. The Elysium volcano, a yellow area north of Cerberus, has several channels radiating from its flanks. The three bright spots, upper left, are volcanoes partially veiled by thin clouds. Hubble's sharpest view of Mars: Although the ACS fastie finger intrudes it achieved a spatial scale of 5 miles, or 8 kilometres per pixel at full resolution. (Viking orbiter, 10 June 1977). Stickney is the largest crater on Phobos, which is a satellite of Mars. It is 9 km (5.6 mi) in diameter, taking up a substantial proportion of the moon's surface. The crater is named after Chloe Angeline Stickney Hall, wife of Phobos's discoverer, Asaph Hall. In 1878 Hall wrote that he "might have abandoned the search [for Martian satellites] had it not been for the encouragement of [his] wife." The crater was named in 1973, based on Mariner 9 images, by an IAU nomenclature committee chaired by Carl Sagan. A rootless cone at Myvatn Lake, Iceland. A rootless cone, also formerly called a pseudocrater, is a volcanic landform which resembles a true volcanic crater, but differs in that it is not an actual vent from which lava has erupted. They are characterised by the absence of any magma conduit which connects below the surface of a planet. Rootless cones are formed by steam explosions as flowing hot lava crosses over a wet surface, such as a swamp, a lake, or a pond. The explosive gases break through the lava surface in a manner similar to a phreatic eruption, and the tephra builds up crater-like forms which can appear very similar to real volcanic craters. Various schemes have been used or proposed for timekeeping on the planet Mars independently of Earth time and calendars. ... that the Nili Patera dune field was the first location on Mars where evidence was obtained of dune movement of a minimum of 1 metre (3 ft 3 in)? ... that a lyric video for the song "Walk on Water" by Thirty Seconds to Mars features user-submitted footage depicting Independence Day in the United States? ... that the Martian dunes of Siton Undae are mostly composed of volcanic glass? ... that the song "Up in the Air" by Thirty Seconds to Mars premiered from the International Space Station in March 2013? ... that astronaut Buzz Aldrin discovered the Aldrin cycler, a means of repeatedly traveling between Earth and Mars? ... that Antonio Fantuzzi's "mildly licentious" etching of Mars and Venus Bathing (c. 1543) probably copies a painting in the six-room bath suite of the Palace of Fontainebleau? Do you have a question about Mars that you can't find the answer to? For editor resources and to collaborate with other editors on improving Wikipedia's Mars-related articles, see WikiProject Mars. This page was last edited on 7 February 2019, at 08:14 (UTC).